Join the discussion on our forums! Come discuss Deathweb Spider over in our dedicated Deathweb Spider discussion topic. If this card came out in before Kobolds and Catacombs, this would be a pretty good card. Unfortunately, due to the fact Warlock has a ton of healing in the forms of 2xDark Pact, 2xLesser Amethyst Spellstone, Bloodreaver Guldan, this card won't see play in Control/Cube Warlock. Sure having a pro-active play could be nice, but there are better cards that can be played turn 5 that help the deck more. As for zoo, this card could find a home there, but the issue I see with this is that Zoo doesn't really care about it's life total, exchanging life for cards. As such, this card could be decent in a mirror/aggro match ups to help you stay safe for a bit longer, but that is about it. However, I still think that running more aggressive minions such as Cobalt Scalebane would be better than this card. Very good for any class. not good enough for Warlock... Arena card. Kind of expensive. I love the lifesteal benefit, but I'm looking for something to replace my 1 mana 2/2 that heals for 4. Great in top deck mode via Hero Power. Synergizes well with warlocks main theme - hurting himself. I missed playing with Floating Watchers, spiders might replace them in a great way. Lesser Amethyst Spellstone coming soon to a Zoo near you. You aint gonna play this one 5. Ergo you gonna play this on 6-7-8-9 mana. I think this card is actually not as good as it may seem. i think us locks are good xD what with it having 6 hp, it's a fairly AoE safe card minus cards like brawl or dragon's fire which is rotating out, then there is Meteor which one would have to be dumb to use on a little 4/6 lol. I know dude. Just let my nursery rhyme be what it is. It's not easy rewriting the itzy bitzy spider to fit an epic Warlock card. lol no i loved your little rhyme. You have made a wise decision. Better version of Blood-Queen Lana'thel. Healing in warlock is always appreciated. Very good synergy with a Blood Witch. Healing potential should not be disregarded. Once on a table with the Lifesteal, this will be a problem for your opponent. Too bad it's a Beast though. 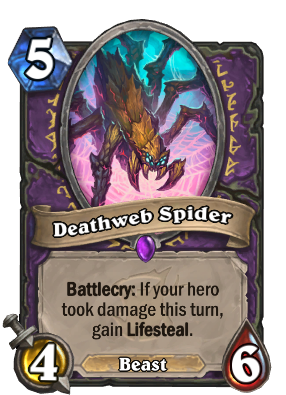 is a possibility we'll see some kinda merg attempt be a thing but it hink this card might actually have it's place in it's own deck and not cube lock though i think the DK might still be a thing because void lord is still a thing and getting back 2 voidlords is always great.